In 2020, shipments from US producers of prefabricated housing are expected to reach 123,500 units, valued at $7.3 billion. Manufactured housing is the largest segment of the prefabricated housing market. US demand for manufactured housing is forecast to reach 85,000 units in 2020. Demand for other prefabricated housing types, including panelized, precut, and modular housing, is projected to rise 5.6 per year through the forecast period. 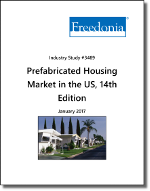 This study analyzes the US prefabricated housing industry, including manufactured, modular, panelized, and precut homes. Manufactured housing is built entirely within a factory on a permanent chassis with wheels for on-road transportation to the placement site. Modular homes consist of three-dimensional sections that are upwards of 90 percent complete when they are shipped from the factory to the building site and placed on a permanent, previously prepared foundation. Panelized homes consist of separate components, such as wall panels and stairs, which are preassembled in a factory and then packaged together for shipment to the building site, where they are installed in a manner similar to site-built construction. Precut homes are constructed on-site from separate components that have been cut to size and predrilled at the factory. Traditional site-built homes using prefabricated building components are excluded from the scope of the study, as are prefabricated structures used for nonresidential purposes.